Winston cigarettes were introduced by R.J. Reynolds in 1954 and at times, the brand has been the best-selling cigarette in the USA. 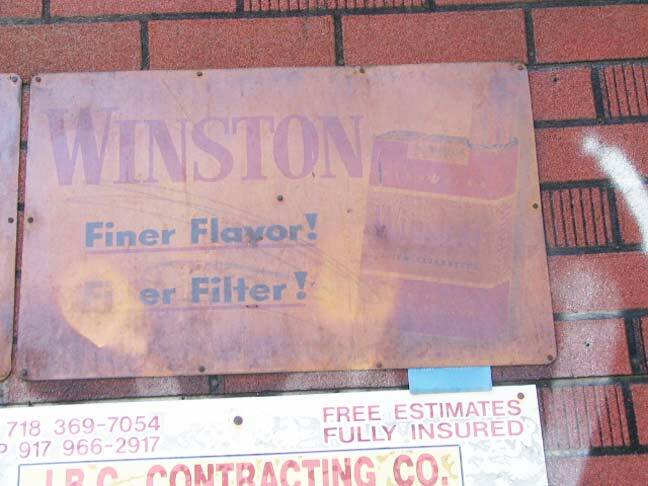 This faded metal Winston sign can be found at an abandoned deli at Bedford and Division Avenues in the Willieburg. Also – “It’s what’s up front that counts”. Prior to 1970, without the U.S. Surgeon General warning. Almost certainly from very early in the history of the Winston brand (based on the pack design), 1954-57. They were advertised on The Flintstones in ’61 I believe.